What is a gearbox ? 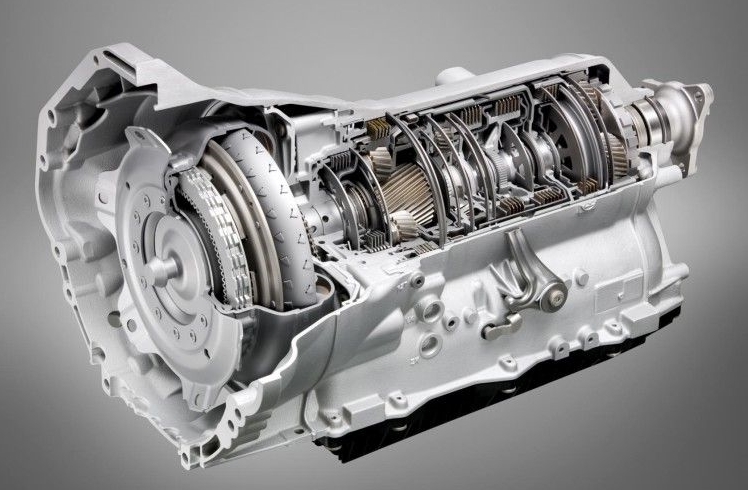 A gearbox or a transmission system in an automobile is a machine which uses multiple gears, shafts and actuating parts to transmit power from engine to the wheels. For more more information, here is a detailed article on gearboxes or transmission systems used in automobiles. This is the most simplest type among all the gearboxes we are going to discuss today. Sliding type gearboxes were the first ones to be used since the beginning of automotive age. All the modern manual transmissions are modified form of this one! When the driver manually shifts gears, the other end of the gear selector fork slides the gears on the output shaft. As soon as the specific gear slides, it meshes with the respective gear on the driving shaft. Thus, power gets transmitted from engine→counter shaft→meshed gears→output shaft→wheels. Different gear ratios and speed of vehicle achieved by combination of sliding position of the gear fork and gear on the output shaft. A constant mesh gearbox works on the same working principle as sliding mesh type with minor differences. In this type, gears on the output shaft are always meshed with the gears mounted on the driving/lay shaft. The difference here is that instead of the sliding gears, there are something called as dog clutches. Dog clutches are square toothed wheels which slide upon the splined output shaft. The dogs when meshed with the gear, produces torque according to the gear ratio and thus further transmitted to wheels. Constant mesh gearbox. The purple gears are dog clutches. the driver had to press the clutch pedal twice for shifting the gear up or down. This was called as double-declutching. This was the biggest limitation of the earlier gearboxes which lead to a newer, modern and a little more complicated gearbox. The synchromesh gearbox eliminated the the daunting task of double-declutching or say synchronising. All the parts and arrangement are similar to those of sliding and constant mesh gearbox except the synchronizers. You can imagine the working of synchronizers similar to that of working of a friction clutch. When the gear selector fork slides the synchroniser, a small high friction disc gets pressed against the gear. The disc gradually attains the speed of output shaft in a matter of milliseconds. As soon as the speed of both is synced, the cover locked the position of both the parts. This whole scenario happens when you press the clutch pedal and shift the gear up or down. Now you could shift gears while declutching (disengaging; pressing clutch pedal) it once unlike the earlier ones. Almost all the cars you drive today with manual transmission like Toyota Corolla or Skoda Superb have synchromesh gearboxes. Epicyclic gearboxes have proved to be a boon to us because of higher efficiency, less noise & availability of higher gear ratios. Also called as planetary gearboxes, they are completely different than the ones above. They are so called planetary because of the arrangement of the gears. Such gearboxes consist of big central gear called as sun, smaller gears rotating around it called as planets & this whole arrangement rotates inside a cylinder/ring called as ring gear OR annular gear. Power can be given to any of the gear & different amount of speed and torque can be achieved by fixing different parts of the arrangement. Epicyclic geartrains are getting immensely popular these days since they are being used in almost every new car having automatic transmissions. Great examples would be Audi A8, the recent 2018 Jaguar F type SVR & even the absolute badass- Lamborghini URUS! If you have read my About Us page, you already know that this is one of my favorite machine. Why? Simply because it is amazing! I was stunned by the idea & the working. Continuous Variable Transmission(popularly known as CVT) is a modern type of automatic transmission which uses belt instead of gears. It has 2 conical sheaves, one on the input & the other on output shaft. One is fixed and the other can slide on shaft. A belt goes around both of the the drums. The radius of belt circling the drum increases and decreases according to the speed of drums thus being able to deliver wide range of torque and output speed. CVTs offer approx 88% efficiency, lower than gear transmission systems but it enables the engine to run at its most efficient speed. CVTs are generally used for low torque applications like scooters but they are offered in cars like Honda Civic & Mitsubishi Lancer.